Hammer mills are designed for getting fine grinded products in the process of simultaneous material grinding and drying. 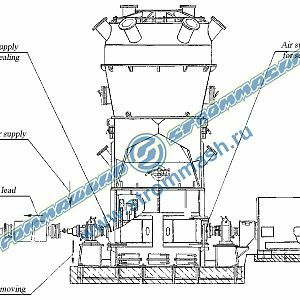 A hammer mill is used for soft minerals grinding and medium hardness minerals grinding. Hammer mills are used to dry and grind coal, dry and grind gypsum, dry and grind dolomite, dry and grind sandstone, dry and grind talc, dry and grind kaolin, dry and grind shell stone, as well as other minerals with similar characteristics. The key hammer tangential mill advantages are the grinding unit energy saving operation and an outstanding ability of this grinder to simultaneously dry grind and dry raw material. The other grinders (ball mills, pebble mills, roller mills, roller mills, etc.) do not have such feature. Another unique hammer tangential mill characteristic is the forced ventilation inside of the grinding aggregate, as well as a high mill rotor speed. Together, these specifications make “Strommashina” hammer tangential mills an excellent choice for any factory that needs soft minerals grinding or medium hardness minerals grinding. 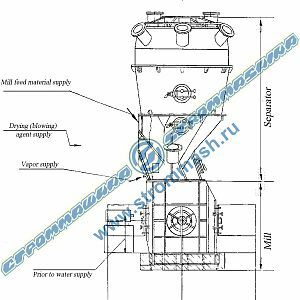 Strommashina corp. is an outstanding hammer mills manufacturer. Our high standards, together with more than 50 years of grinding equipment manufacturing, make us one of the top grinding units manufacturers and specifically a top hammer mill manufacturer. Mill can be produced with drive mirroring on customers request.